Alive! 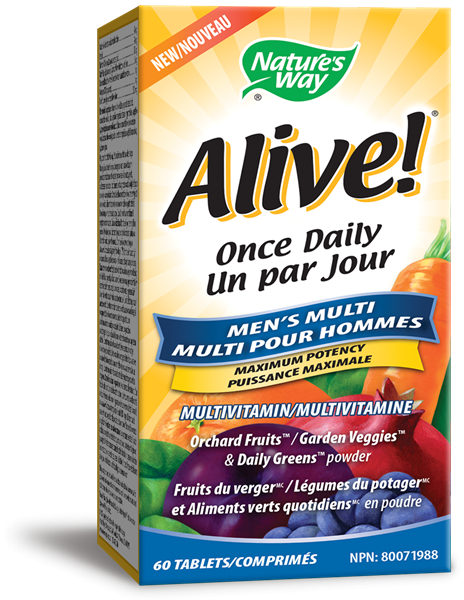 Once Daily Men's Multivitamins are a complete and invigorating once-daily formula including nutrient blends from whole foods. Alive! Once Daily Multivitamins are a complete and invigorating once-daily formula designed specifically for men. Alive! 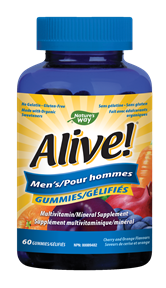 Men's multivitamins have the full B-complex of vitamins and come in an easy-to-take once daily tablet. Now including 6 nutrient blends made from whole foods like our Energy Blend, Daily Greens Blend, and a Digestive Blend as well as our Alive! Orchard Fruits & Veggies Blend. Alive! Men's Once Daily tablets help in the maintenance and support of skin and strong bones, support immune function, and helps the body metabolize carbohydrates, fats and proteins. 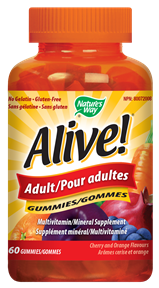 Feel alive with Alive! Men's Once Daily multivitamins! Consult a healthcare practitioner prior to use if you are taking any prescription medication or anticoagulant agents or anti-inflammatory agents, antidepressant medications, blood thinners, cardiac glycosides such as digitalis/digoxin or blood pressure medication. Consult a health care practitioner if you have any type of acute infection, a history of non-melanoma skin cancer, diabetes, gastrointestinal lesions/ulcers, or if you are having surgery. Consult a health care practitioner if symptoms persist or worsen. Contra-indications: Do not use if you have high blood pressure, if you have bipolar disorder or bipolar spectrum disorder or if you have a history of systemic lupus erythematosus. Do not use if you have an allergy to Asteraceae/Compositae (daisy) family. According to TCM, do not use in cases of yin deficiency with heat signs, heat excess, or in the absence of significant qi deficiency. Known adverse reactions: People sensitive to nicotinic acid may experience flushing of the skin that is generally mild and transient. Some people may experience irritability, insomnia, anxiety, or headaches, in which case, discontinue use. Hypersensitivity/allergy is known to occur, in which case, discontinue use. Diuretic effect may occur. 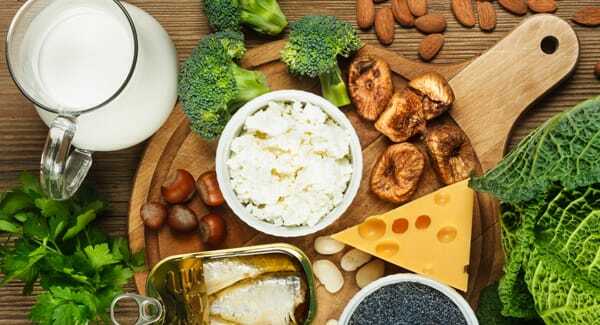 Microcrystalline cellulose, vegetable stearic acid, croscarmellose sodium, silica, vegetable magnesium stearate, hypromellose, vegetable glycerin. May come into contact with dairy. Men's Multivitamin for the maintenance of good health. Adult Multivitamin for the maintenance of good health.